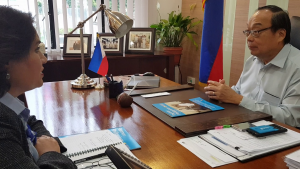 A former top corporate executive, the new Philippines Ambassador to the Republic of Singapore, HE Joseph Del Mar Yap talks to Editor-in-Chief Ms Nomita Dhar about his forthcoming plans. You have come to Singapore frequently over the years (including a short stint as the Special Envoy of the Philippine President to Singapore from December 2016 to June 2017). 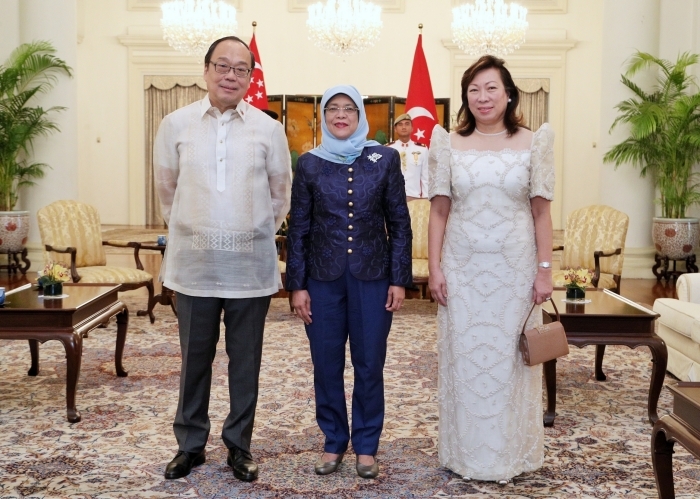 As you are well acquainted with the island republic, and also in the light of the synergy of what the Philippines needs and what Singapore can offer – what are your plans and what you hope to achieve during your tenure as ambassador here? As ambassador, my duties encompass two major tasks: The first is the welfare and protection of the rights of the Filipino workforce here. We have 180,000 Filipinos working in Singapore. 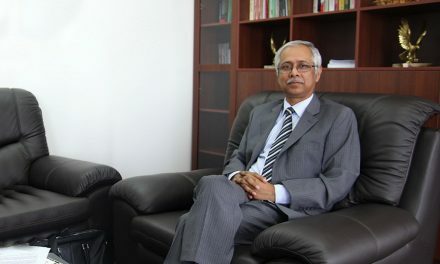 The second is to continue developing and strengthening bilateral relations with Singapore. Next year we will be celebrating the 50th anniversary of bilateral ties between our two nations. So in the light of that we will be working on various aspects of those relations amongst which will be the trade and investment aspects. Given my personal background as a business person from the private sector, the trade and investment side is something I understand considerably. In my previous career, we had business dealings with Singaporean corporations including a joint venture with Singapore’s Government Investment Corporation or GIC (that manages the Republic’s foreign reserves)… so on and so forth. So this is something I would like to see develop and I think there are many opportunities in the Philippine right now with the building up of our infrastructure the new projects are being undertaken, the planning of new cities etc. 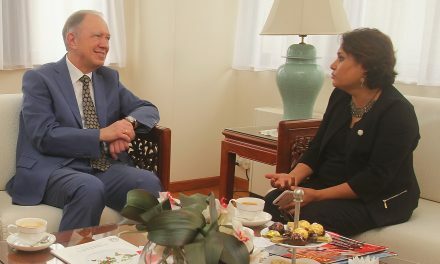 We have been in close talks with Enterprise Singapore which is one of the parties that we are talking with to foster more investments and relations between our two nations. Last year the Philippines was the ASEAN Chair, and this year it is Singapore’s turn. There appears to be better continuity in developments on that front because of this. So with you here how do you think you can leverage on this? I think one of the highlights of our relationship with Singapore is that our chairmanship last year was quite successful for ASEAN. We have told our counterparts here that we are ready to render whatever assistance we can to make Singapore’s chairmanship a very successful one. We are ready to cooperate in whatever way possible. Many of our cabinet secretaries have already been coming to Singapore to join the senior ministerial meetings for the ASEAN Summit in April. We are also organizing several other activities along the sidelines of the summit meetings to generate more interest for Singaporean businesses if they are interested in investing in the Philippines. Our economic ministers will also be holding meetings on the sidelines to generate this kind of cooperation. So are there any conferences, seminars and meetings etc being set up in the meantime? We will be holding certain round tables meetings, may be certain conferences—the details are still being planned. But certainly within this year there will be a couple of times when our ministers will make themselves available to interact with the Singaporean business community, to emphasise that the Philippines is still on the growth track; we are looking for 6 to 7% growth in the next few years and that there are so many opportunities for further investment for Singaporean countries. What always amazes me is the energy of the Filipino work force, the education level and the immense desire to do better. So with all this going for the Philippines what would you say to Singaporean companies who are waiting in the wings and haven’t quite decided to enter this market? I would repeat what our President has already said, that the Philippines is open for business. We are encouraging not just Singaporean companies but also international ones based here, to look at the Philippines and explore the possible opportunities there not only in infrastructure or the new planned city projects but also in a whole lot of other sectors such as the consumer market. For example, there are many companies in Singapore going into the food business, opening up franchises there. There are a whole range of opportunities outside Manila, in regional cities as the Philippines’ government is encouraging investments in these areas as well. You will find even there there a huge pool of well-educated workers who can be easily tapped for recruitment for new businesses. There are therefore endless opportunities as well as many resources at the disposal of the new companies that wish to invest in these regional areas. What is the reason, do you think, for the gap between the potential and the activating of it? I would say the reason had something to do with the past. But in the last several years this has not been the case. The Philippines has shown continual growth to the tune of 6 to 7% every year. This has translated into growth of a burgeoning middle class. One good example is the Business Process Outsourcing (BPO) industry. Philippines employs 1.2 million people in this sector and they joined the BPO industry straight from college or university. These are good high paying jobs. The growth of in this sector has translated into other areas such as the consumer market. This is reflected in the boom in many openings of new restaurants and coffeehouses. All these workers now have disposable incomes which they can use on such indulgences with the resultant multiplier factor affecting other sectors of the economy. The Philippines is no longer considered ‘the sick man of Asia’ because of slow business development. In the last few years there has been very robust development, a really big jump in employment as well as economic performance. How ready is the Philippines with regards to new emerging or disruptive technologies that are creating new or a parallel economy so to say? Actually there are many start-up companies in the Philippines today. Many are in areas such as big data, payment systems etc. They have went into the digital space of businesses. My son, who has a computer background, has just taken a position in a start-up and my contemporaries also have companies that have set up start-ups. Many are not afraid especially the young, millennial generation to enter the digital space. Mainline industries are also finding their voice in this area using digital technology, advertising, reaching out by Facebook and other social media. We are definitely going to see more of this and it can only continue to grow. Filipino workers have contributed greatly to Singapore’s economy and also working here in homes etc. How do you plan to engage with them and what are the issues you would like to shed light on during your tenure here? Out of the 180,000 Filipinos working here that I told you earlier about, about 60% are engaged in some profession or skilled activity and only about 40% are domestic workers. For us in the embassy the welfare of our people is a paramount concern so we attach much importance to engagement. We have monthly Filipino Community Meetings where we invite the community leaders to discuss and exchange views and make announcements on different projects that involve Filipinos here. We have 100 Filipino community organizations in Singapore that are registered, representing different interest groups. Some are school activists, some are NGOs that are working primarily for the welfare of the workers; they also offer training courses and provide legal services etc. The embassy is always at hand if they get into any difficult issues to help sort out matters. If you had an opportunity to replicate something from Singapore in the Philippines and vice versa what would it be? I wish we could copy a lot of things from Singapore in the Philippines, but there are differences in our culture and in our political set up which would make it hard to do. But I would really like to have a way to solve our traffic problems in the Philippines, especially in Manila, those might be more easier to replicate there! Which are your favourite places in Singapore? What do you do on weekends? Nowadays I’m mostly working but when I came here in the 1990s with my family we went to Sentosa (the kids were still very young then) and the Night Safari was another family favourite. There are so many things to do here. I like the Chinese and seafood restaurants which are very good. Given the chance I would like to go to Sentosa to relax. The Singapore diplomatic community is quite active. Since the Philippines is relatively near (about three and a half hours flight time) how would you encourage them to visit and enjoy your country over long weekends? We are organising something which we used to do – arrange trips for the ambassadors. We are looking into reviving this again. There many places and things to do and see people may not be aware of and we would like to encourage more them to visit my country. Can you share some highlights about your career and your family? I used to work for Nestle, then I got married and was posted on an international assignment. My in-laws have a business and they asked me to join them. I have been working with them for 35 years becoming Vice President and retiring as CEO of several of their subsidiary firms. I have two boys and a girl. My daughter went on the study at Harvard Business School and is now back in Manila. I think in a couple of years she will join the family business and help her mother who runs it now. My wife and I have a deal. I will go to Manila a couple of times a month and she will come here. Since I’ve joined in January this year I’ve just managed to go once a month! Is there a great a difference between what you were doing earlier and now? Yes and no. The actual job as a diplomat is obviously quite different from that of a businessman. Being in the public sector is also quite different as you need to abide by the rules which have to be strictly followed. When I was a businessman it was considerably easier as I could make my own decisions as CEO in the company. But the important things don’t really change – basically knowing what you need to do to achieve your objectives, goals and key results. In that sense it’s the same. BIO SUMMARY Prior to his appointment as Ambassador to Singapore, His Excellency Joseph Del Mar Yap served as the Special Envoy of the Philippine President to the Republic of Singapore from December 2016 to June 2017. He was the President and CEO of various companies under Filinvest Development Corporation, one of the largest conglomerates in the Philippines that has interests in banking, property development,real estate, power generation, agriculture and hospitality. Ambassador Yap holds a Bachelor of Science (with Honours) in Management Engineering from the Ateneo de Manila University. He also obtained a Masters Degree in Business Administration (MBA) from the HarvardBusiness School. Ambassador Yap is from the Province of Cebu, Philippines. 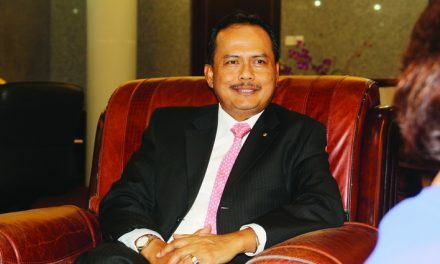 He is married to Lourdes Josephine Gotianun Yap and they have three children.